Though it may not look it, here’s a first example of the most complex and interesting system in the game. We covered the moving box in the last post, but here we see the Moving Platform (an example of an “activateable”) and the Button (an example of an “activator”). The reason this gets complex is that there are many different types of both activators and activatables, and any of them can be connected to any other. A button can unlock a door, a lever can light a fire, blowing on a pinwheel can spawn a pushable box, lighting a torch can unlock another door and so on and so on. As of now, in the beginning of the game, I have only worked with one-step-solution puzzles, like the one above. But as more features gets introduced, my ambition is to make these kinds of puzzles bigger and bigger. Two-, three-, and four-step-solutions, and something I really interesting in experimenting with is three-step-solutions where the first step actually blocks the third step, and the second step has to be done to undo the gridlock caused by the first step. 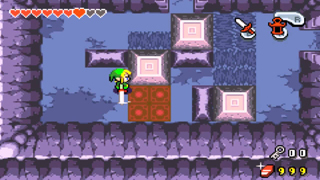 It’s difficult to explain, but The Minish Cap does this gloriously in the Temple of Droplets.